Brian Brosdahl caught this nice ‘gill from late ice on one of the Bro Bugs that he created for Northland Fishing Tackle. If the ice-fishing season was like a football or basketball game, we would be at about halftime. We’ve had a good amount of ice-fishing so far, but there’s still a lot of outstanding ice-fishing opportunities to come. In fact, many avid ice-anglers will suggest that the best is yet to come for this ice-season. Here are some reasons and ways you can get in on the upcoming action. I actually like the last half of the ice season better than the first half. We can certainly get around on the ice better, and that’s a big advantage. This time of year it’s not unusual to drill dozens of holes in the ice in our attempts to find fish. The ice is thicker and there’s more snow on it, so the fish aren’t as easily spooked. And, although truck traffic will still spook fish this time of year, it’s probably not as noticeable as it was earlier in the season. The weather also gets more pleasant as the season progresses, and that makes us more likely to get out and move around. I like to put an auger, a sonar unit, and some baits in my Otter Cottage shelter and just start moving. Even with all my gear, the Cottage pulls easily and is very comfortable and efficient to fish from. Sometimes I’ll lose track and realize that I’m quite a distance from the truck. When that happens, I either fish the holes I’ve already drilled back to the truck, or I make new ones as I head back. Sonar is such an important part of successful ice-fishing. This time of year we usually don’t sit on a hole for more than 5 minutes if we don’t see a fish. This year I’ve been using a Vexilar FLX-20. This unit does all I need it to do to help me see and catch more fish. Simply put, if I don’t see fish, I don’t hang around. However, if I do see fish and they don’t want to eat what I’ve got down there, I show them something different. Maybe I’ll move the bait faster or slower, or go larger or smaller, change colors, change bait style, just change. And sometimes they don’t want to get caught. That’s when we move to a different hole. One negative about this time of year: The fish have been getting a lot of fishing pressure. They’ve seen a lot of baits so they can be a little more finicky, and a lot of fish have been caught, so there’s just fewer of them down there. Now is the time to abandon community spots and go out searching for new spots that maybe aren’t as popular. There might not be as many fish on these less-known locations, but the fish there might not be so selective either. Find different fish and show them different presentations and you’ll be successful. Downsizing and going with a less visible line is a really good idea this time of year, especially when the panfish are super finicky. 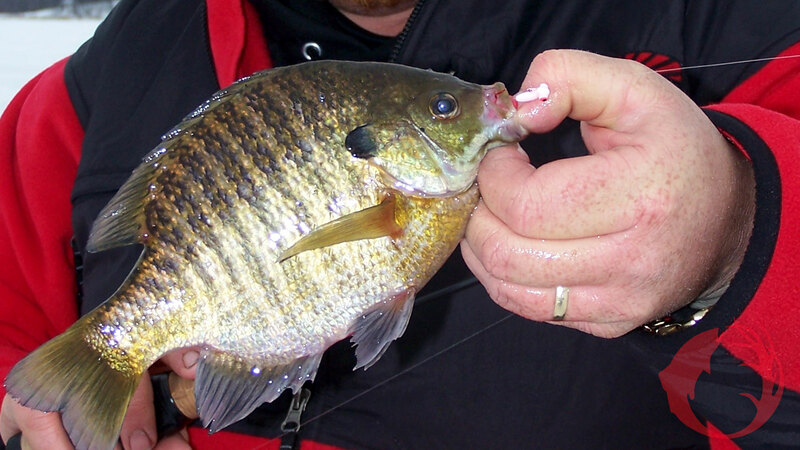 When ice-fishing, the fish can get a very good look at your lure, and line can spook them. P-Line Floroice in a lighter weight will be next to invisible, but still very strong and manageable. If you don’t want to spool up completely with light line, use a 2 foot leader of 3 or 4 pound test Floroice. The weather is warming and getting more stable, the days are getting longer, and the fish are willing to bite. If you get out on the ice in the next few weeks, the odds that you’ll catch a few are good, and that should be enough of a reason to go ice-fishing while the ice is still safe.